Series of fewer than ten “kek-kek-kek” notes. Notes are evenly spaced. Description: Sexes similar. Feathers on back are black with tawny edges. Buffy eyebrows, cinnamon colored breast. Flanks have strong black and white barring. Long legs, and long slightly decurved bill. 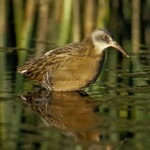 Habitat: Freshwater marshes with plenty of shoreline and emergent vegetation. 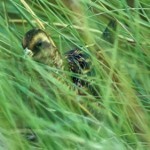 Where in Nebraska: Rare summer resident in eastern Nebraska. Probably a local breeder. 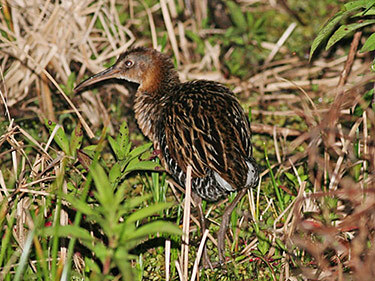 Field Notes: Occasionally hybridizes with Clapper Rail. 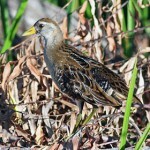 Fun Facts: When King Rails catch food on land, they often take the item to water and dunk it before eating it.